Introduction: What is Answered Insight? Answered Insight is an online survey company in South Africa. You will be paid to take surveys. I have been with Answered Insight for about 4 years. Registering was easy and once you have registered you fill out your profile. The more details you put in your profile the more surveys you are likely to receive. They didn’t ask for any personal information, only information like whether you are the main decision maker for purchasing certain things in the household, information on pets you own and how many children in the household. I started receiving surveys quite soon after registering, however the surveys do not come often. If there is a survey available that you may be eligible for they send an email with a link to the survey. The first few questions are screening questions to check if you are eligible for the survey and if you aren’t they let you know immediately. You then get added into a draw to win R1000 (which I have never won). Most of the surveys I have been eligible for. Each survey takes anything from 5 – 20 minutes to complete. They work on a point system. Each survey you take is usually worth 10 points. 10 points has a cash out value of R20 (appr $1.60). Cashing out has always been easy. There is a nice big cash out button on their website, the first time you cash out you just enter your banking details and they transfer into your account within 5 days. The next time you cash out your banking details are in their system so you just click cash out. It is clear from the survey questions that these are real surveys sent in by real companies in South Africa. It has been very rare that I have not been aware of the brands in the surveys. Overall a very user friendly experience and everything is very much legit and honest. 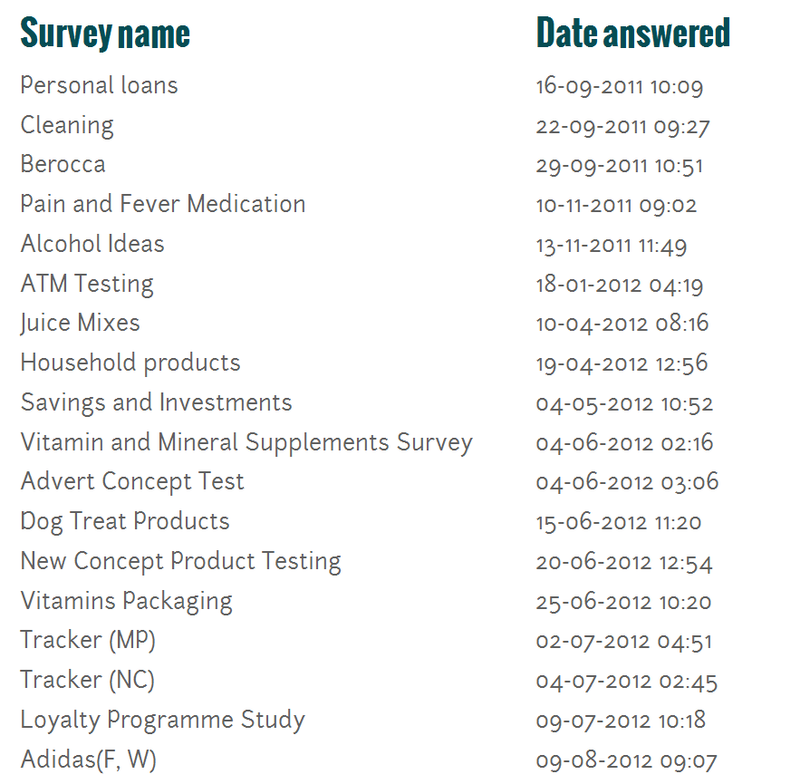 Here is a screenshot from my account of the first surveys completed so you can see how often you receive them. Looking to make a little more money than this and from anywhere in the world? Check out my #1 recommendation! Who is Answered Insight suitable for? Anyone that needs a bit of spare cash will like this. Although you really can’t earn much I have often forgotten about it and my points have built up nicely. A few times when it has been a painful money month I have remembered I have points owing to me and cashed out about R1000 which really did help me out. Are you interested in a small online business opportunity instead of just pocket money? I haven’t seen any training or tools available, but this is such a simple system there is no need for any training. You receive an email, click the link and answer the questions in the survey. I have only ever contacted them via email to ask a question and they replied same day. Judging by this I would say their service and support is good. Is Answered Insight a Scam or Legit? They are 100% legit and that is why I have stayed with them for a good number of years. I wouldn’t give up your day job for this! However if you don’t have high earning expectations it is lovely to have some extra money for a rainy day. It is honest and legitimate work which is a breath of fresh air after all the scams I have come across online. Have you tried out Answered Insight yet and what has your experience been like? If you have any feedback or questions please leave a comment. 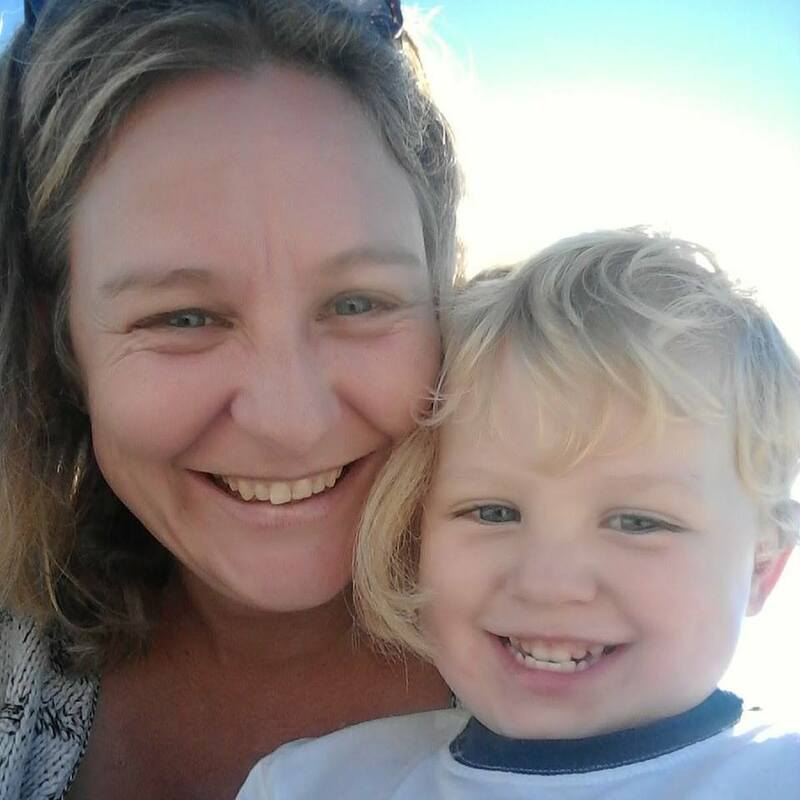 Hi LynneHuy… I have tried some of these survey company’s and answered many of their questions only to say that I did not fit their profile. Is their any company who asks for surveys and tells you ahead of time what age group, gender, education, career they are looking for? This way a person responding doesn’t waste their time. This is the only company I have found that doesn’t waste time or mess around. I think I have only been kicked out of about 4 surveys in 4 years by Answered Insight which I think is not bad and each time it took abut 30 seconds before I found out I didn’t get in. I am still searching for other survey companies that really pay CASH and that don’t mess you around. I will share if I find something. Every other company I have found offers vouchers and not cash, or they claim to pay cash but I have no idea if they do or not because I have only been given the run around! I used to join a lot of them survey companies, and I only found a two or three really good ones that were honest. Even then I never made more than 100.00 a month, and that was with many hours of doing surveys. It has been awhile and a lot of the companies I see here I have never heard of. Have you joined all or any of these survey companies? Can you really make a lot of many doing surveys? Hi David 🙂 I think if you want some pocket money to go and have a milkshake online surveys will do just fine. If you want something more than the odd treat at the end of the month no, this will never work for you! I have wasted loads of time searching around and majority seem to mess you around or pay pennies. Check out my Getting Started page if you want to start your own online business. It is not get rich quick, you will need to put hard work and dedication into it, just as you would any new business venture! what are the other Survey companies that you have found to be really honest? Please share with us. To be honest I have found none yet! I will keep searching for a decent, honest survey company and if I find anything I will share with you. Hi Lynne, I was having a chat with my younger brother the other day and he was telling me how he gets paid for completing surveys online. I understand it’s entirely possible to build a business on the internet, but I’m a little skeptical about filling out surveys and things, especially when he told me that one company inparticular refused to pay out. With that in mind, I thought I would jump online and see what survey companies are legit and I found your site. Can I just ask, in the four years that you have been with Answered Insight Surveys, have they ever refused to pay out? If they haven’t, then I may send him a link to your site so he can take a look for himself. Hi Lee 🙂 Of course you can send him a link! I have never had a problem being paid out with them. Every time they have transferred my payment within the 5 days as promised. I don’t think anyone will ever make lots of money through online surveys… but Answered Insight does as promised and they are so far the only honest and legit online survey company I have found. If your brother wants to work online, ask him to look at my Getting Started page. I have joined many survey companies in the past and all of them disappointed them, further the amount they pay is appropriate to the time it take, as if you devote that much time to something useful, you might create much better value and money. Have you came across any survey company that paid atleast $1000 a month ? If yes, do let me. Nice to see you here again 🙂 I have found plenty of survey companies claiming you can make much more than $1000 a month, however they have all appeared to be scams. This is the only no BS website I have ever found and as you see the most I have ever made is about R100 in a month which is about $80. Sorry to disappoint you but I honestly don’t think it is possible to make a living from online surveys. If I do come across something new that does work I will show it to you. Thanks for sharing about Survey Savvy, I’ll certainly check them out soon. Great website with such great information. Yes it is a South African survey company which is probably why you had a problem signing up. It really is a pity as so far this is the only no hassles company I have come across. There have also been plenty I found previously that looked good but I couldn’t sign up and have a look because it is not available in South Africa. I’ve joined surveys web sites before and I always found that my country “Egypt” has very few surveys available. So, I knew that surveys quantity depend on your profile and location. The more interests, goods, persons in the family the more surveys you will receive. Language is very important too, most surveys will be in English. I never knew much about getting paid to do surveys despite the fact that I see information on surveys popping up now and then. It’s good to see that some of them are legit, because I figured that they were mostly just scams. Every online survey company I have come across to date, with the exception of Answered Insight) is either a complete waste of time or a scam. So yes I do agree with you on that! Even this one you cannot make more than a little bit of extra money, certainly nothing to rely on. Great review! I myself also tried several surveys online and i tell you your efforts don’t match the money given. I spent many hours doing the surveys but just gave me a quarter or penny for every survey done. Thats why i searched different ways online on how can i make money online. And i bumped into wealthy affiliate. Im just on my first month but i already learned many things and i feel like my fruits of labor is soon coming. By the way, is the income in wealthy affiliate is better than just doing surveys? Thanks for visiting. Yes the effort for taking surveys is really not worth the money you can make online. With affiliate marketing you have the control, it will take a while before your start making money online bit all your efforts will be rewarded. It is not an immediate solution to making money online, it is a business you are building from the ground up. Yes you can make good money online with affiliate marketing, put the work in and you will succeed. This is a useful review as you’ve really panted a picture of what it’s like to work for this particular company and what someone could realistically expect to make. That’s refreshing. Do you happen to know of any survey companies outside of SA? I’m guessing that company is only interested in surveying local consumers with knowledge of local products.. Thanks for any information you have. Yes you are correct, Answered Insight is only available in South Africa unfortunately. Try Opinion Outpost, they are really good too and I got exactly the same feel from them. No nonsense and all just about surveys unlike other that I tried such as Mintvine and Toluna, they just messed me around. Click here for my review on Opinion Outpost. Is opinion outpost available in South Africa? Yes I believe that they are still available in SA – I have used them before. However if you sign up with Clixsense you get loads of surveys from many different survey sites – I have found Clixsense to be the best. I’ve come across many of these online survey sites and I must say it’s a nice change to see this bunch handle matters of payment in cash for once. There’s nothing worse than going through the mind numbing process of online surveys to end up with a load of gift cards instead of cold hard cash. How much have you earned with them over the 4 years? I had to quickly add it up for you! I have taken in total 124 surveys since joining Answered Insight. My first survey was on the 16 September 2011 so it almost exactly 4 years. That is an average of R51.67 (USD 3.91) per month. Not exactly making a fortune here! Yes that is my experience too! Answered Insight is legit, however as you say the earnings are so little. Since I did this review I have earned another R140, which is about 10 USD. Although I must be honest that was from 7 surveys they have sent me and there really has not been a lot of time spent on it. I get an email, click on it to enter the survey and it takes me 5 mins to do the survey. I don’t get spammed by them or kicked out of surveys. But there is no way to earn more money. R140 (10 USD) in about 2 months is not a lot of money. I can’t even take my family out for a cheap meal on that! I have liked your defense of Answered Insight Surveys and even though I do not do surveys yourself, I’d say that’s a good way to review any product. I have oftentimes tried doing surveys and I always ended up being kicked out- sometimes due to address, etc. So I no longer do them. Thanks for visiting. Yes for what Answered Insight is they really are a great and honest company, but you will ever make much money from them. I just enjoy them because they are honest and do what they say they do with no BS! Your article provides a good review on a topic that many people are looking into these days. I myself was doing the same thing when I came across WA. I was looking into various ways to work from home and this was one way that I considered but luckily found WA first. I like how you provided the pros and cons which came across very open and honest. It appears you have done some research in this area and are able to offer good advice. I like at the end how you lead into an opportunity at WA! Yes I like Answered Insight, they really are a legit company and I wanted to show them as they are. I have been with them for a number of years already and I am still with them but I the money I make from them is nothing to get excited about. I have experienced little success in the past with online surveys because of the lack of rewards or cash. However, times have moved on and Answered Insight Surveys does seem like a way to make some money, like you pointed out. This program is a good way for people who are looking for a little extra “fun money”, and it’s great to know it’s free too! Yes I have also had very little success with survey companies, Answered Insight is the exception which is why I keep on with them. It is not a lot of money, but it is also hardly any work. I like to let my points build up for a least a few months to make it worthwhile when I do cash out. Answered Insight sounds like a legitimate survey company that will pay you to take surveys. Like you said, doing survey companies will not pay the bills, but it might give you a little extra money to have if you only need a few extra bucks to buy a bag of groceries. Thank you for the article. Was there a cash out threshold, like do you have to have a certain amount of points before you can cash out? HI Stephanie, yes you must have 50 points to cash out, which is the equivalent of R100. I’ve got 90 points at the moment but waiting to cash out when it gets a little more so I can spoil myself with something. I usually wait until I have about 200 points. I read the article about answered insight surveys. I have been looking for a way to supplement my income. You have done a good job bringing up that they are legitimate and showing their process. I will say that this sounds like a good program for children in the household to earn allowance. Hi William, there you go, pocket money for kids! However you have to be 18 to participate and of course they are interested in people that make decisions for households and who work…. these are the opinions that count the most. They want to know the mindset of people with buying power! Hello Lynne , I am so glad you are recommending a legit survey opportunity.We have seen enough of scams or low quality products lately , generally online. Of course I won’t quit my job for surveys , it is just a few extra bucks that for some people , really mean a lot. I only hope this is available to my country.Good job , as always , you outlined everything , no room for questions. Hi Tasos, Answered Insight is currently only available in South Africa. Otherwise give Opinion Outpost or I Say Surveys. I am very familiar with survey sites, but I am not a big fan of them in overall. It is the first time that I have heard about Answered Insight. To really be successful with surveys, you need to join multiple companies and only complete the highest paying surveys. Just do not expect to earn a full time living out of doing surveys. Yes my sentiments exactly, but even with multiple companies I don’t think there is much chance of earning a full tine income. Plus there is the side that it is boring and not very fulfilling work! Am excited to be on your site, it gives me the joy to have discovered Clixsense and now Answered insight as pocket money opportunities. I have the sign in with clixsense, though, have not started a serious business with it yet, but I know am going to be making extra income which is certain. Now, am also interested in Answered insight, can I sign in as a Nigerian? I should believe I can. I appreciate your hard work in searching out these great sites, may God bless you for this, thanks for sharing these opportunities. I am really not sure if you can sign up from Nigeria, please let me know if you were successful or not 🙂 As far as I understand it, only South Africans can sign up. Clixsense is really turning out to be the best pocket money opportunity for me so far. Am chatting from Nigeria . can I do the survey and earn money like others. Daniel I am not sure, you can go to their website and check! Good luck.